Babi Guling (roast pig) is intact pig that has been cleaned, then stuck a long stick from the buttocks to penetrate the mouth, then roasted over the fire, twisted around until cooked. Babi Guling (roast pig) not only as food, are also made for an offering to ancestral spirits as a form of gratitude for everything that is given. That is why in Bali there are many manufacturing services roast pork, based on orders. Babi Guling (roast pig) very easy to come by in Bali. Because these foods are very popular. Pigskin which has matured as crackers are very good to eat. Sausage with delicious stuffing. 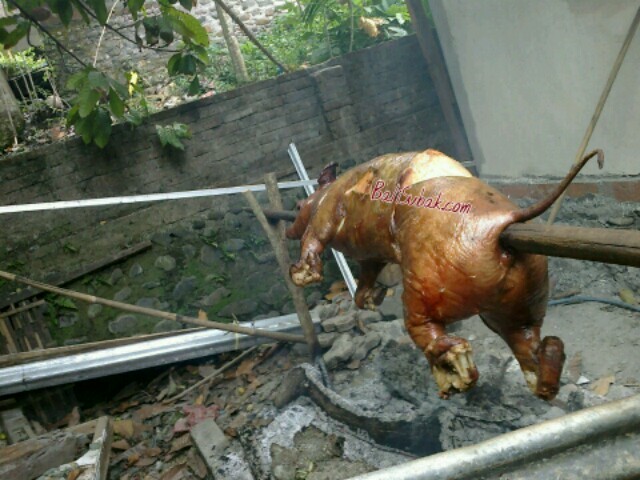 Babi Guling (roast pig) usually made with jointly by a group of citizens. Because the pig slaughtering process very complicated. Ranging from bleeding, remove the hair with fire, eviscerate, to make the seasoning as aroma enhancer. Fire also made to fit that the baking process can run smoothly and perfectly cooked.